Here at FLATSIXES, when we do something important and life changing, it should always involve a Porsche somehow, don't you think? Well, a couple of weeks ago, I got married to the love of my life. She's always been my best friend and inspiration, and she even stuck with me after I dragged home a ratty 944 a few years ago. It must be love, right? Not only that, but she knows her cars pretty well, too. 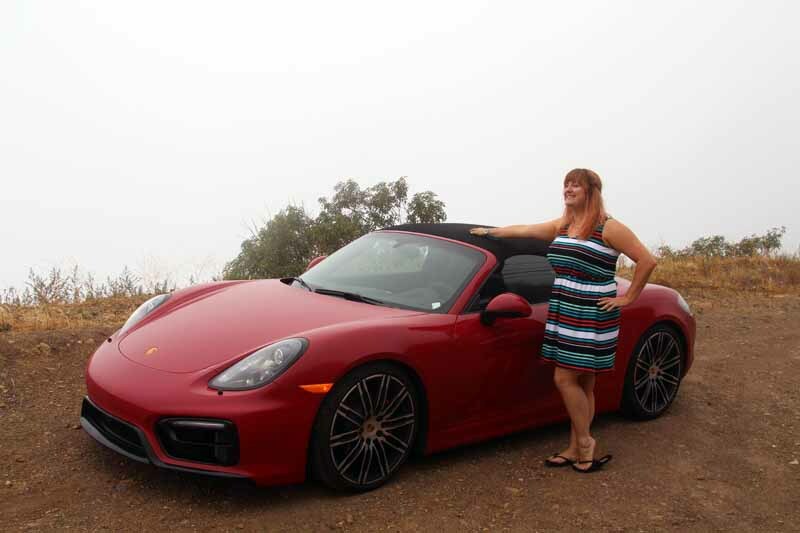 So after the wedding, we had the opportunity to fly down to Los Angeles for four days, spend four days with a gorgeous new Boxster GTS, courtesy of Porsche (keep your eye out for our review). Not only that, but I'd scheduled some pretty cool Los Angeles area car-guy meet and greets as well, so there was plenty to do in the area. After a perfect wedding, it was the perfect honeymoon. First thing as soon as we landed, we had to find our way to the parking garage to retrieve our chariot for the week. This gorgeous Carmine Red Boxster GTS was waiting for us, spit shined and looking so nice. As soon as I laid eyes on it, I thought "There's no better car for sunny southern California". The lines of the 981 Boxster just have the look for me. It's like this car were sculpted particularly for my tastes, as it just ticks all of the boxes. Because the wedding was in Michigan, and our flight left early Monday morning, we didn't land in LA until about noon, so most of our time Monday was spent getting the car, finding our hotel, unpacking, and trying to deal with changing time zones again. As luck would have it, a couple of our good friends from Reno were visiting Los Angeles the same week we were, so we arranged to meet them for dinner and walking around town. A quaint little beach side restaurant down on the Venice boardwalk was quite delicious, and then a nice post-dinner walk up the stylish and hipster-esque Abbot Kinney boulevard was a treat. As my wife and I are both from Michigan, and our friends originate from Wisconsin, after striking up a conversation with a cyclist on the sidewalk, he said "You guys aren't from around here, are you? You're too polite!". It was a bit non-sequitur, but hilarious all the same, and a good way to end the evening. Tuesday was the big "Car Day" that I had planned. One of our four days in the city would be almost entirely dedicated to cars, and the others were dedicated to post-wedding relaxation. There was a lot to see and do, so we started pretty early in the morning. If you're familiar with the greater LA area, you'll already know that Costa Mesa is pretty far from Century City, where we were staying, but that's where we started. I have a few friends and acquaintances down at European Collectibles, and I just love their shop, so while I was in town, I promised the guys that I'd stop in to see them for a bit. As usual, the shop was immaculate, and was absolutely packed with gorgeous Porsches. It was early enough when we arrived that there weren't many people doing their Porsche shopping, so we were allowed pretty much the run of the place, snapping photos and chatting with friends I hadn't seen in a few months. Of course, I had to go poke my nose in their 904's business for a while. It was interesting to note that we were driving around in a dark red mid-engine Porsche with GTS on the back, while they had this original dark red mid-engine Porsche with GTS on the back in their showroom. It wasn't until much later that I finally thought about it, but it would have been really cool to get a photo of the Boxster GTS and the 904 Carrera GTS side by side. Regardless, it was gorgeous. And that 996 GT3 sitting next to it was spectacular as well. I've never seen a 996 in such good condition. This white impact bumper car belongs to one of the employees of the shop, and he's been working on it for quite a while. The race-inspired widebody, 3-piece wheels, and slick tires make for a great look, especially with the unfettered rear decklid devoid of large wings and spoilers. It's a unique look, but I really dig it. Inside, he's got a pair of 996 GT3 RS seats that are so wide they almost contact the side window glass with the doors shut. There is always something really cool to work on at European Collectibles. This early 356 coupe is waiting to be turned back into the gorgeousness it once was. In case you needed any further reasoning that EC might just be the coolest place in the LA area, their showroom was quite literally packed to the gills with cars looking fresh as the day they were built. There were a few non-Porsches there, but not many. The ones they did have were certainly worthy of sharing the showroom space with the best of Porsche, though. After European Collectibles, we stopped over around the corner to visit Bill Doyle (Rennwagen/Honest Engine), the guru of all things Fuhrmann Four-Cam engine. He knows his stuff, and he's got the parts and expertise to get it done. If there's a four-cam engine anywhere in the world right now, chances are pretty high that Bill has had something to do with keeping it alive and ticking. I didn't take any photos while I was there, because I'd never met Bill in person and didn't want to intrude, but after conversing with him for a good hour, I'm not sure he would have minded. He stopped what he was doing to give my wife and I a tour of the shop, showing off some exquisite cars and engines. His little engine-building room is fascinating, with empty four-cam cases lining the walls, you know, 'just in case' (pun intended). Our second stop of the day was to visit my friend Blake who works at the Petersen Museum. 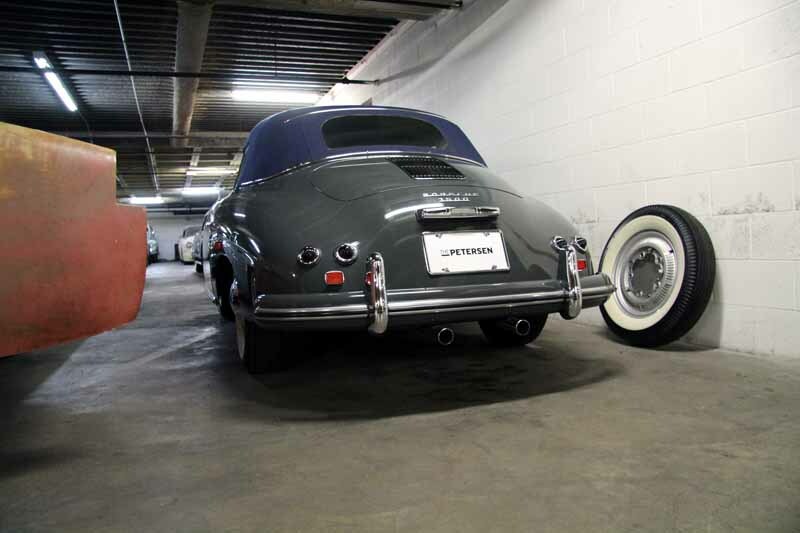 As some of you might know, the Petersen is currently closed for a massive renovation, and all of their cars are currently being stored in the basement. As such, we were given a nice tour of the cars in the basement, but most of them had car covers on them to protect from the construction dust. There were some phenomenal cars there, but sadly only a couple Porsche models. Icons of design, for sure, but perhaps not the most exciting things in their collection. This gorgeous blue on grey 1955 356 Continental Cabriolet has always been one of my favorites, and that fantastically simple 'bent' windshield just makes it all the better. There's something about the so-called Pre-A 356 models that makes me giddy. The design is so simple, and unfettered. There is less clutter in the shape of the body and the headlamps are right where they were supposed to be (later models had them moved up on the fender a bit, ostensibly for safety reasons. Sat just ahead of the Continental was this beautiful 1964 '901', one of only very few early 911s still holding the 901 designation. It's not quite as early as "Barbarossa" we saw a few years ago, but I've only ever seen two or three other 901s, so this was certainly a treat. While traditionally Volkswagen-based, the air-cooled engines have always had a place in SoCal car culture, and these two would have made excellent beach-comber cars back in their respective days. What could have been better than tossing your longboard in the back of your brand new Porsche circa 1955 and going for a nice drive down to the shore? Stop number three for the day was to visit our friends up at Singer Vehicle Design. I was there to talk a little bit of shop, but I've always wanted to get up close and personal with one. My wife has a background in textiles, so it was great to see her reaction to Singer's gorgeous interior fabrics. 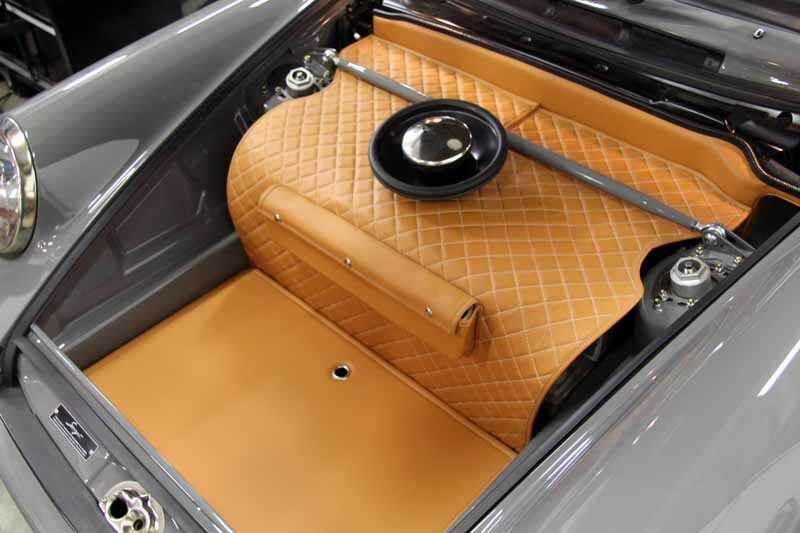 Their quilted leather front trunk and engine compartment liners, combined with the basket weave leather covered Recaro seats and gorgeous recovered dashboards, just make the cars look so exquisite. Porsche makes great cars, but Singer makes these great cars legendary. While we were visiting, we got to look at the fantastic new Singer Targa model that just debuted at Goodwood Festival of Speed. I asked politely if I could take a photo of it for publishing at a later date, but I was told "That car does not exist" in not so uncertain terms. It's not highly detailed, but I did manage to sneak it into the background of this photo above. There was still some final fit and finish as well as some engine tuning being done before it got shipped off to Goodwood, but goodness did it ever look the part. It was fantastic, and I'm lucky to have seen it essentially before anyone else. One of Ed Pink's famous 4-liter air-cooled engines sitting out back in the coupe (there was another in the Targa) looked clean enough to eat off of, and it sounded like heaven constrained in an exhaust just trying to get out. The front trunk is almost never seen, and yet they dedicate so much time and effort into making theirs look so nice. The little pouch even holds a new Porsche pop-up road hazard triangle. That through-the-hood fuel filler cap is just the finishing touch that any Porsche needs to achieve maximum perfection. Just look at the details of this car. It's got the widened carbon rear quarter panels covering massive wheels and tires, it has all of the right bits, including the oil tank access on the outside with a beautifully machined cap. The color matched wheels and brake calipers make a good detail to look out for. The contrastingly bright interior accents fit the bill, too. The simple driver-oriented three-spoke steering wheel is so enticing, you just want to reach out and grab it. What a car. What a day. What a trip! Of course, a trip to Singer would not be complete without stopping to meet the shop dog. This gruff looking little one was so relaxed and pleasant, and willing to give a wag of the tail in exchange for a scratch on the head. I'd already been away from my own dogs for over a week at this point, and I was definitely missing them. Behind 'shop dog', you can see the original inspiration for the Singer design aesthetic. This is the owner's personal R-inspired longhood 911, and all subsequent Singer cars, while 964 based, have taken on at least some of the soul of this beauty. After Singer, we headed back toward the city, stopping again at our hotel to get cleaned up for dinner and drinks out on the town. It's pretty simple these days, just dial up an Uber and head out. Then you don't have to worry about drink driving, or LA traffic, or getting lost. We met up with our friends again that evening for a trip to the Upright Citizens Brigade for a lovely comedy show. That particular evening, they were performing a double-feature comedy musical version of Jurassic Park and King of Kong: A Fistful of Quarters. It was an absolute laugh riot, and I cannot recommend it enough. Bright and early Wednesday morning, we decided to go for a nice drive in the canyons above Malibu. We didn't make it over to the Angeles Crest Highway, but I'd been there before, so we stuck to some of the smaller and emptier ones in the north west of the area. Topanga was pretty fun and relaxing, and there were a number of other roads we got lost on where we didn't see a soul for over half an hour. While we were expecting a nice and sunny week in the area, it was actually quite foggy and rainy pretty much the whole trip. Everything was kind of dreary, but the diffused lighting made for some decent photos. The fog made it difficult to do any fast driving, as I didn't want to out drive my forward vision, which in some places got quite low. The higher we got, the lower visibility it was, and the road, while not exactly wet, was a bit slick. I could feel the traction control system working to its fullest coming out of some of the corners, but it was still enough to have a lot of fun from the driver's seat. We spent most of the day Wednesday driving around, sampling local cuisine, stopping at a few used book stores and record shops, and just driving along the Pacific Coast. That evening, we went to another comedy show, this time a group of stand up comedians performing in the back room of a comic book shop called Meltdown. If you're familiar with the Nerdist network (new media content including youtube videos, podcasts, and other comedy and nerdy related content), then you're probably familiar with the Nerdmelt room. The show was run by Jonah Ray and Kumail Nanjiani. It was a great lineup of comics, including Shane Mauss, Chris Thayer, director Judd Apatow and Andy Kindler. Again, it was a lot of fun, and afterward we found what is probably the best Thai food I've ever eaten just across the street. Thursday was our day to travel back home in the afternoon, so we didn't make any major plans for the morning. We got up early in order to drive up to the Planetarium for a quick visit. After which, we hiked the 4 miles up to one of the major vista points for the Hollywood sign. Unfortunately, it was foggy enough that this was our view. Such is life. We still got in a lovely hike and had a lot of fun on our trip to Los Angeles. We gained a lot of really cool stories to tell, and had a good time doing it. While I really wish the weather had been better for our trip in the Boxster, more conducive to having the convertible top lowered, anyway, it was still a great time, and what a great car to take that trip in. We'll touch more on the car in a future review, so keep an eye out for that later this week. Congrats on your wedding, and nice road trip/honeymoon!